I am in a Norman Rockwell stage. 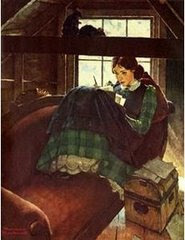 I've been spending time looking through a huge book of his work, and was delighted to find his Louisa May Alcott series. 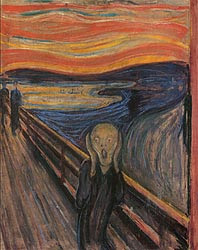 The above picture is, simply, "Jo March in the Attic". I love "Little Women". I remember how thrilling it was to discover that there were other books after it..."Little Men", "Jo's Boys", etc....but nothing ever replaced that original story of four sisters in my esteem. This painting makes me smile because it reminds me of how desperately I wanted to be Jo March - feisty and brave, locked away in some special spot reserved for writing and imagining the rest of the world. (I think that a part of me could very well turn into a hermit, lost in an internal world. This may be the reason God decided I needed a family so early. So that I couldn't become the proverbial crazy cat lady. [at least not yet.]) When Jo finally got those stories published, but couldn't be proud of them, I was so torn for her - wanting her success to be truly admirable, for her to be happy with it...and then there's her book at the end, after the grief of losing Beth....I wanted to write something like that, too. Something with meaning, something special. Something to be proud of. Thinking about "Little Women" takes me back to that wonderful phase of childhood...that time when I could just lie around and devour books by the pile. I had this great reading and diary-writing spot -- not in an attic like Jo, but outside on this big wooden swing in a corner of our yard. It was shaded by some wild trees covered in kudzu and angled so that I didn't feel exposed to the world. I named it something like 'Windy Hill.' I had a great penchant for naming places after L.M. Montgomery came into my brain. I also wrote out my diary entries to 'Kitty' for a few years after reading Anne Frank. I was, um, quite an impressionable kid, apparently. But maybe it was more than that - I think, by trying to imitate these great people and characters, I was attempting to bring some of their magic into my life. Because that's what great books still do for me - they remind me that even the ordinary moments can be sacred...they make me want to have purpose and to aspire for greatness. They make me look at the daily within the larger picture...and to know that it's the scenes - the dialogue, the day to day action - that make up an entire life. So to infuse the knowledge that it all counts, even the small stuff, for the greater meaning of my life...it makes a difference in how I look at this house with the toys from scattered on the floor, the stray cat stretched out asleep on the back porch, the cell phone ringing in the next room. The fact that there are books in this world that can make someone savor life more...that bring on a smile....it feels like such an extravagant gift! Our pastor used a quote last Sunday by a fellow named Stephen Grellet. I liked the quote and so looked up Mr. Grellet, who turned out to have had quite an interesting life. Anyone who starts out as a body-guard for King Louis XVI, escapes an order to be executed during the French Revolution, and ends up as a Quaker missionary in America definitely would have a few life-lessons up his (ruffled, in this case) sleeve. "I expect to pass through this world but once. Any good things, therefore, that I can do, any kindness that I can show a fellow being, let me do it now. Let me not defer or neglect it, for I shall not pass this way again." Sean's prayer at bedtime sort of floored me tonight...he started out with this: "God, please give me -"
And in that pause, I was thinking...and here it is. The first time he asks for God to give him something more than a safe night and good dreams. And with the amount of time it was taking him to think it up...I was getting ready to hear a request for Power Rangers or a dog or Transformers...and a part of me was sad, that his innocent baby prayers might be turning into the 'I want' list instead...I didn't expect it quite so soon. But he continued with this: "Please, God, give Christian a new toy car that's really fast on a roller coaster that's a toy that he likes." And on with the regularly scheduled prayer. It actually brought tears to my eyes. This 4 year old's instinct is to pray for a blessing someone else would enjoy (and he's the first one to always say that Christian likes cars, but he likes superheroes...it was actually a selfless toy request). Another life lesson from my kid. Organize tax information. Get some idea of what might be owed to our government. I decided to take a semi-break from housework and my writing to-do list in order to spend a little extra time playing with the boys...so instead of scribbling in the notebook or folding laundry while they had art-time, I colored with them. We had an indoor picnic for lunch, a fort-building session in the early afternoon, and a long drawn out battle of ninjas versus invisible foes. Multiplying foes, I might add. Every time I thought we had surely been victorious (aka, my 'karate' was tiring me out), Sean would say "oh, no! There are twenty more behind you!" He informed me that they were getting in through the fireplace, so I tried "blocking" it with large couch cushions...didn't help one bit. Those bad guys were tricky. And, by the way, it is hilarious for me - the girl who spent her "pretending" years with younger sisters, doll babies, Anne of Green Gables, and tea sets - to be playing Mommy Ninja. This playing with boys thing is a whole new world. After a few extra stories at bedtime, we went into what is usually the sweetest part of my day - lights out (as long as they're being cooperative. we all know that forcing a 3 and 4 year old to stay in bed when they don't want to is less than a fun time...). After I tucked them in and had given all of the requested kisses and hugs, I turned on our current bedtime playlist (Josh Groban, Ella Fitzgerald, a few jazzy pieces by Miles Davis) and listened to them say their prayers. There is nothing quite like hearing their spontaneous conversations with God...Christian mainly mimics Sean and adds a hearty amen...but, still, it's a perfect display of innocent faith - a faith that it becomes harder to hold onto as we grow older. Listening to Sean thank God for taking care of our family (with a name by name list) reminds me that worry is pointless....just like Sean is certain that Mommy and Daddy will be there to pour his apple juice in the morning, he's certain that God will take care of us. It's wonderful to bask in the simplicity of his world...because it's a simplicity intended for mine, as well. As I sat there in the quiet beside of the bed, I had one of those moments where it just hit me...how precious these days are. Right now, it's just the three of us during the day, with our own little world...trips to the park are still marvelous outings to them, grocery shopping is an adventure, a picnic in our own back yard is something akin to the golden ticket. It takes so little to thrill them....just a little time and imagination. I'm going to do my best to make the most of these last months...because in June, it'll get a little harder to play so freely...and then, in August, the biggest chunk of Sean's day will be taken up by school. I guess that's a Mama's biggest prayer - let my children's cups overflow with blessings until the floor's flooded...let the blessings rise and rise until they're doing the backstroke through love, peace, and grace...totally and completely inundate them with Your goodness. 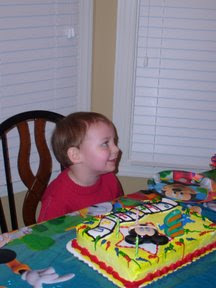 The moment Christian decided to do what his aunts and uncles were telling him to do: That's right. Forget forks. Forget civilized behavior. 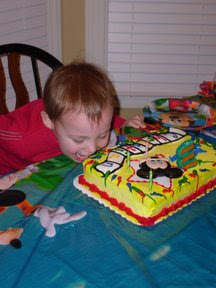 Teeth are made for birthday cake consumption, are they not? When he says he's gonna' do something, he's gonna' do it. 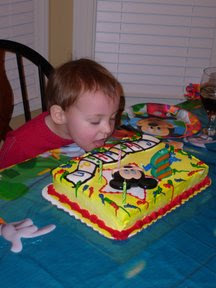 He bit out of that cake from one end to the other, much to the delight of my siblings. I blame them. But I didn't stop him. At least not for a while. You only turn three once, right? 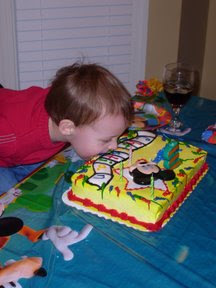 And, honestly....don't you want to eat your next birthday cake just like that? Does anybody else remember this tv show? It was definitely in that prime era of TNBC....Saturday mornings rocked, baby, with Saved By The Bell, Hang Time, City Guys...and of course California Dreams: Please feel free to watch the opening credits and feel 13 again. Anyway. That's all just to prove that the glamour and wonder of California is ingrained in us at a tender age here in the US of A...Saved By The Bell was all about California grooviness, too, if you'll remember. And who among us didn't, at some point, see about 5 billion episodes of Saved By The Bell? So last November, when Neil and I flew out to LA for vacation, it was finally my chance to see all of this magic in person. And you know what? Even though, somehow, I didn't spend my time singing in a band at a hip beach club or playing beach volleyball with Zack Morris (AND I didn't wake up blonde, tan, and a size 2! What was that about???? 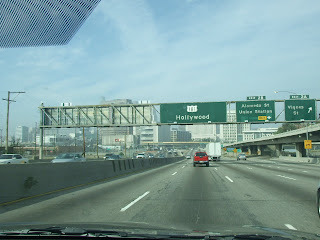 ), there was definitely something different about California. It's one of those places where the air is filled with opportunity(because you CAN get discovered on a random street corner, right? )...and it's surreal to see the places that have formally been bound to your tv screen as reality. We had so much fun...and since it was just the two of us, we were constantly on the go. (And we did crash the second we walked into the hotel room. Ok, I crashed the second I sat down anywhere, but there wasn't much I could do about that. Baby-in-uterus still trumps vacation adrenaline, apparently.) 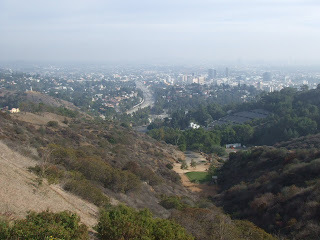 We crammed in at least 4 theme parks, a zoo, museums, tourist-y celebrity tours, a Laker's game, a showing of Wicked (amazing, by the way)....and we even got to have a personal tour from an insider. Our visit with the always wonderful Ms. BCT was definitely a highlight. My favorite museum, by the way, was in the original Max Factor building...it was all about historical Hollywood and so much of it was preserved from the days when Lucille Ball, Judy Garland, and other amazing actresses would visit to get their make-up done for their shows. 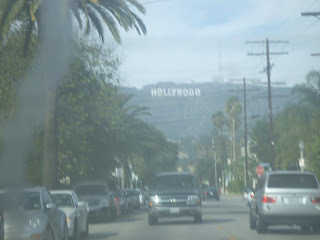 I love the classic Hollywood days, so seeing so much original memorabilia was a thrill for me. We have arrived! We start dodging paparazzi....now. We dodged pretty well, by the way. We somehow didn't end up on a single magazine cover or news broadcast. And our first awesome puchase in Hollywood? Band-aids. Yep. Ten minutes upon arriving on Hollywood Blvd, I'm in a pharmacy because my shoes are not all that broken in. Woo-hoo! Bring it ON, vacation! There she is! 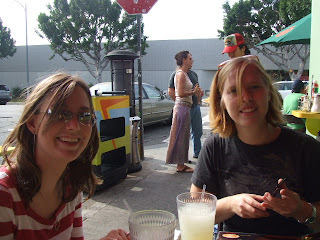 My long-time friend turned Hollywood local, giving us our first California meal. 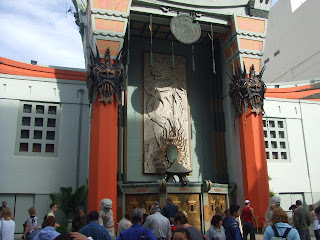 The Chinese Theatre, which is where you'll find all of those infamous hand and foot prints. The inside is even more impressive than the outside. 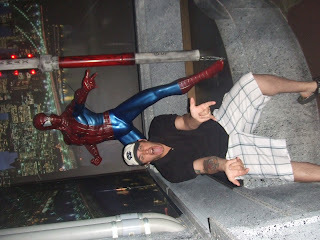 And below you'll see my husband jumping into action during our visit to the Hollywood Wax Museum. Spidey's energy was contagious. Sorry that I don't know how to rotate the picture with this Blogger machinery. 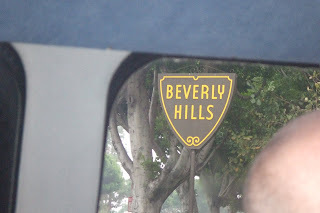 Da-du-dudu, da-dududu....um, that's the theme song to Beverly Hills, 90210 you're hearing in your head, too - right? 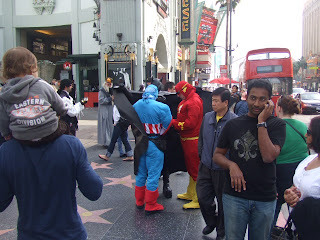 And why can't we all live in places where superheroes mingle on the streets? That's Captain America, the Flash, and Batman all in one huddle. Rest easy, LA. You're well protected. 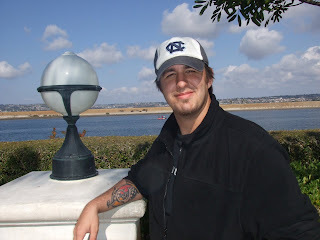 Mr. Neil at Seaworld...blue skies, blue water, and still representing the Tarheel Blue on the hat. You can take the Heels out of North Carolina, but...you know the rest. 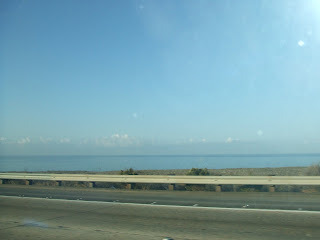 The drive down to San Diego was gorgeous. Ocean on one side and the beginning of mountains on the other...I was all 'ooh! ahhhh!' the entire way. 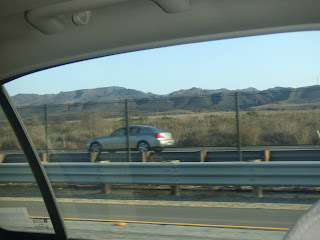 The pictures from the (moving) car don't begin to do it all justice. 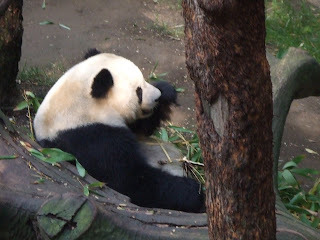 The panda is at the San Diego Zoo and too sweet to resist. I wanted to carry him home with me, but I couldn't figure out where I'd buy bamboo once I got him here. 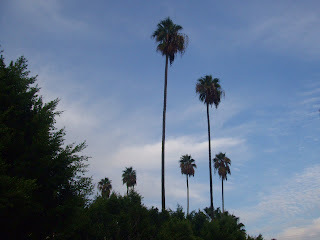 And...palm trees. Because it was, after all, California. The past five months or so have been a period of incubation for me, in more ways than one. Creatively, I had pushed through a major draft of my novel and the inevitable rewrites....and then, of course, came the onslought of queries and rejections. My brain got really, really tired. I was still writing bits and pieces of things in the little notebook, but nothing cohesive...just ideas, scenes, character descriptions. And then came news. My body was working on a creative endeavor of its own - baby number three! And this little one, ladies and gents, is a girl. Neil and I are overjoyed with this new development...with Sean starting school this summer and Christian just turning three, it seems that the timing is right. She is due to join us out here in the real world on June seventh....so we still have some time to prepare. And to think up a name. The naming process was easy for the boys....this girl, however, may end up Baby Girl Lambert in the hospital if we don't start narrowing in on the perfect name soon. So with the pregnancy came lots of happiness....and lots of pure exhaustion inside of my skull. Until that first trimester was well over, I had to force myself to follow the normal routines....and I could barely keep my eyes open long enough to sketch out a paragraph. (This blog and the world of the internet was apparently the largest victim of this condition. But I tell ya' - I missed it!) For a while, I just needed to indulge in reading and trying to convince my boys to take naps with me. And, of course, there was the need for BBQ potato chips and Mexican food...this kid likes the spicy stuff. Fortunately, things started boiling again a few weeks ago and the long months of eensy production have rolled into several new short stories and a major overhaul (gulp) of that crazy book of mine. Time equals objectivity with this writing thing, and I definitely needed a good dose of that! So I keep learning that wise Mr. Solomon was so right -- there are seasons for everything. And with a new addition to our family so welcome, I know we're moving into a season of joy.